The 1988 born Barbadian singer Robyn Rihanna Fenty better known as Rihanna is just intrigued by tattoos. Being influenced by stalwarts of the pop music world like Beyonce Knowles, Whitney Houston, Mariah Carey and above all Madonna, her desire is to be the ‘Black Madonna’ of pop music. The tattoo of goddess Isis on her chest is a tribute to the late grandmother of the singer. Goddess Isis was depicted as the ideal mother and wife and that is what she believes her grandmother to be. 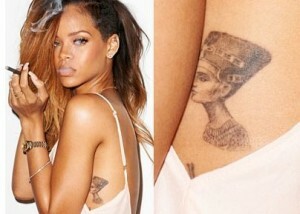 The second interesting tattoo of Rihanna is that of Queen Nefertiti. While the reason behind this tattoo is not known but some believe that as Nefertiti was known as the Lady of Grcae, hence Rihanna got her tattooed.